Mobile ads are getting more and more belligerent these days. From the usual in-app ads, to whole widgets dedicated to serving ads and even pushing ads to the notification bar. Unsolicited notification bars ads space are, perhaps, the most annoying of the lot because a. they use up space in the notification bar b. it is often difficult to tell which app is responsible for them. A new, simple to use app called Push Ad Detector from Lookout Security has been released today that detects the presence of the ad networks pushing these ads and the app using them. Push Ad Detector scans your device for the presence of a select number of ad networks that are capable of displaying out-of-app advertisements. When an ad network is detected within an app on your phone, Push Ad Detector lists the app and the ad network. We’ve tested the app on a Samsung Galaxy S II on Android 2.3 Gingerbread and can confirm that it works as advertised. Due to our relatively clean app-installing habits, Lookout Push Ad Detector couldn’t detect the presence of any ad network on our device. As of typing, Push Ad Detector detects six of the most popular ad networks: Airpush, Appenda, LeadBolt, Moolah Media, TapIt! and Startapp. More networks will be supported in the future. For developers looking to make money from their apps, we suggest you stay away from push ads. The enthusiasts community hates, nay loathes, them and will most likely uninstall your app if they find out that it is sending ads to the notification bars. Consider going the ads-supported free version and a ads-free paid version route. 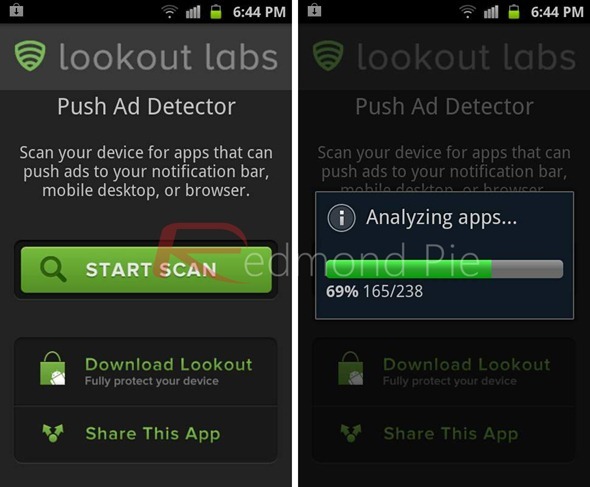 Lookout Push Ad Detector is a free app and it can be downloaded from the link embedded below. If you see annoying ads in your notifications bar, you can use this to detect and uninstall the responsible app. Be sure to let us know what you think of it in the comments section over on Facebook or Google+ page.